The Uyghur ( ; ; IPA: [ʔʊjˈʁʊː]) are a Turkic ethnic group living in Eastern and Central Asia. Today Uyghurs live primarily in the Xinjiang Uyghur Autonomous Region in the People's Republic of China . Large diasporic communities of Uyghurs exist in the Central Asian countries of Kazakhstan , Kyrgyzstan , and Uzbekistan . Smaller communities are found in Mongolia , Pakistan , Afghanistan , Turkey , Russia and Taoyuan County of Hunan province in south-central Mainland China. Uyghur neighborhoods can be found in major cities like Beijing, Shanghai, Sydney, Washington D.C, Munich, Tokyo, Toronto, Istanbul and Adelaide. Throughout history, the term Uyghur has taken on an increasingly expansive definition. Initially a small coalition of Tiele tribes, it later denoted citizenship in the Uyghur Khaganate. Finally it was expanded to an ethnicity, which ancestry derives from two distinct populations: Turkic and Tocharian. The fluid definition of Uyghur and the diverse ancestry of modern Uyghurs are a source of confusion about what constitutes true Uyghur ethnography and ethnogenesis. The first use of Uyghur as a reference to a political nation occurred during the interim period between the First and Second Göktürk Khaganates (630-684 CE). In modern usage, Uyghur refers to settled Turkic urban dwellers and farmers of Kashgaria or Uyghurstan who follow traditional Central Asian sedentary practices, as distinguished from nomadic Turkic populations in Central Asia. The Bolsheviks reintroduced the term Uyghur to replace the previously used "Turk" or Turki. Linguist and ethnographer S. Robert Ramsey has argued for inclusion of two other ethnic groups, the Yugur and the Salar, as subgroups of Uyghur (based on similar historical roots for the Yugur, and perceived linguistic similarities for the Salar). These groups are recognized as separate ethnic groups, though, by the Chinese government. The English transcription of the Uyghur ethnonym [ʔʊjˈʁʊː] is Uyghur. Typically, Uyghur is pronounced as /ˈwiː.ɡər/ by English speakers; however, /ujˈɡur/ is closer to native pronunciation. Currently, several alternate spellings appear in literature: Uighur, Uygur and Uigur. "United Nine Tribes," a replacement for Tokuz-Oguz the tribal alliance of which the Uyghurs were part. The Chinese referred to Uyghurs by the ethnonyms Hoy-Hu ( ), Üan-Ga (Chinese:? ; Pinyin:? ), and Chiu Hsing ( ). Another suggested etymology is a composite of quick (Turkic:uigy) and man (Turkic:er/ir/ur) for Quick People. The earliest record of an Uyghur tribe is from the Northern Wei Dynasty (386-534 AD). At that time the ethnonym Gaoche ( ) to the Tiele tribes. Later, the term Tiele ( ; Turkic: Tele}}) itself was used. An 8th century Uyghur Khagan. 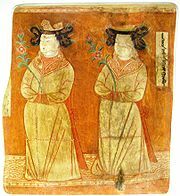 Uyghur princes wearing robes and headgears. Uyghur history can be divided into four distinct phases: Pre-Imperial (300 BCE – 630 CE), Imperial (630–840 CE), Idiqut (840–1209 CE), and Mongol (1209–1600 CE), with perhaps a fifth modern phase running from the death of the Silk Road in 1600 CE until the present. In brief, Uyghur history is the story of a small nomadic tribe from the Altai Mountains rising to challenge the Chinese Empire. After the collapse of the Uyghur Khaganate in 840 CE, Uyghur resettled to the Tarim Basin, merging with the existing Tocharian population. Ultimately, the Uyghurs became civil servants administering the Mongol Empire. The ancestors of the Uyghur tribe were Altaic pastoralists called Tiele, who lived in the valleys south of Lake Baikal and around the Yenisei River . The Tiele first appear in history c 357 CE under the Chinese ethnonym Gaoche, referring to the ox-drawn carts with distinctive high wheels used for yurt transportation. Tiele tribal territories had previously been occupied by the Dingling, an ancient Siberian people, some of whom had been absorbed into the Tiele. The Tiele practiced some minor agriculture and were highly developed metalsmiths due to the abundance of easily available iron ore in the Yenisei River. The Tiele were subjugated by the Xiongnu in c 300 BCE, who put them to work manufacturing weapons. For this reason they have often erroneously been attributed a Xiongnu origin. After the collapse of the Xiongnu empire they were passed as vassal metalsmiths to the Rouran and Hepthalite States. A Tiele tribe of twelve clans, the Fufuluo ( ) , gathered enough power to create a state, the A-Fuzhiluo kingdom (481-520 CE), in Dzhungaria. The Fufulo are often listed as Uyghur ancestors in Chinese history, famously in the Suishu. In 546 CE the Fufulo lead the Tiele tribes in a struggle against the Türk tribe in the power vacuum left by the breakup of the Rouran state. As a result of this defeat they were forced into servitude again. This incident marked the beginning of the historic Türk-Tiele animosity that plagued both Göktürk Khanates. (Note: at this time Tiele replaces Gaoche in Chinese history.) At some point during their subjugation, nine Tiele tribes formed a coalition called Tokuz-Oguzes Nine-Tribes which also included the Xueyantuo (Syr-Tardush), Basmyl, Oguz , Khazar , Alans, Kyrgyz, Tuva and Yakut under the leadership of the Xueyantuo. In 600 CE Sui China allied with Erkin Tegin, Bey of the Uyghur tribe, against the Göktürk Empire, their common enemy. This alliance was the first historical mention of the Uyghur tribe, which then resided in the Tuul River Valley with a population of 10,000 yurts (~40,000 people). In 603 CE the alliance dissolved in the aftermath of Tardu Khan's defeat, but three tribes came under Uyghur control: Bugut, Tongra and Bayirqu. In 611 CE the Uyghur led by the Xueyantuo defeated a Göktürk invasion; however, in 615 CE they were placed under Göktürk control again by Shipi Qaghan. In 627 CE the Uyghur, now led by Pusa Ilteber, participated in an another Tokuz-Oguz revolt against the Göktürks, again spearheaded by the Xueyantuo tribe. In 630 CE the Göktürk Khanate was decisively defeated by the Emperor Tang Taizong. The Uyghur occupied second position after the Xueyantuo in the Tokuz-Oguz. However, in 646 CE when the Uyghur bey, Tumitu Ilteber (吐迷度) was granted the Chinese title Prefect ( ) it established a legal precedent for Uyghur rule. He overthrew the Xueyantuo and established a short lived Uyghur state over the Mongolian steppe. From 648-657 CE the Uyghur, under Pojuan Ilteber (婆闰), worked as mercenaries for the Chinese in their annexation of the Tarim Basin. In 683 CE the Uyghur bey Tuchiachi was defeated by Göktürks and the Uyghur tribe moved to the Selenga River Valley. From this base, they struggled against the Second Göktürk Empire. By 688 CE the Ugyhur were controlled again by the Göktürks. After a series of revolts coordinated with their Chinese allies, the Uyghur emerged as the leaders of the Tokuz-Oguz and Tiele once again. In 744 CE taking advantage of the power shift caused by the Battle of Talas , the Uyghur, with their Basmyl and Qarluq allies, under the command of Qutlugh Bilge Köl, defeated Göktürks. The following year, they founded the Uyghur Khaganate at sacred Mount Ötüken. Control of Mt. Ötüken had been, since the Xiongnu, a symbol of authority over the Mongolian steppe. Properly called the On Uyghur Toquz-Oghuz Orkhon Khanate, the Uyghur Khaganate stretched from the Caspian Sea to Manchuria and lasted from 745 to 840 CE. It was administered from the imperial capital Ordu-Baliq , the first city built in Mongolia. During the imperial phase, the term Uyghur( ) denoted any citizen of the Uyghur Khaganate, as opposed to the Uyghur tribe. After the Battle of Talas , the Uyghurs quelled the An Lushan rebellion and defeated the tibetan invasion of China. The Uyghur Khaganate asserted a defacto soverignty over China. Although they planned an invasion of the Tang Empire, they choose instead to use an exploitative trade policy to drain off the wealth of China without actually destroying it. In return for this 'service' they policed the borders and quelled internal rebellions. Large numbers of Sogdian refugees came to Ordu-Baliq to escape the Islamic Jihad in their homeland. 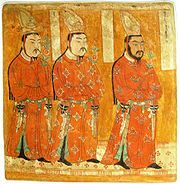 They converted the Uyghur nobility from Buddhism to Manichaeism. Thus, the Uyghurs inherited the legacy of Sogdian Culture. Sogdians ran the civil administration of the empire. They were helpful in outflanking the Chinese diplomatic policies which had destabilized the Göktürk Khaganate. In 840 CE, following a famine and civil war, the Uyhgur Khaganate was overrun by the Kirghiz, another Turkic people. As a result the majority of tribal groups formerly under Uyghur control migrated to what is now northwestern China, especially to the modern Xinjiang Uyghur Autonomous region. Following the collapse of the Uyghur Khaganate, the Uyghur gave up Mongolia and established kingdoms in three areas: present day Gansu , Xinjiang, and the Chu River the West of Tian Shan (Tengri-Tag) Mountains. Yugor, The eastern-most of the three Uyghur states was the Ganzhou Kingdom (870–1036 CE), with its capital near present-day Zhangye in the Gansu province of China. There, the Uyghur converted from Manichaeism to Lamaism (Tibetan and Mongol Buddhism). Unlike other Turkic peoples further west, they did not later convert to Islam. Their descendants are now known as Yugurs (or Yogir, Yugor, and Sary Uyghurs, literally meaning "yellow Uyghurs") and are distinct from modern Uyghurs. In 1028–1036 CE, the Yugors were defeated in a bloody war and forcibly absorbed into the Tangut kingdom. Karakhoja, The central of the three Uyghur states was the Karakhoja kingdom (created during 856–866 CE), also called the "Idiqut" ("Holy Wealth, Glory") state, and was based around the cities of Turpan (winter capital), Beshbalik (summer capital), Kumul , and Kucha . A Buddhist state, with state-sponsored Buddhism and Manicheism, it can be considered the center of Uyghur culture. The Idiquts (title of the Karakhoja rulers) ruled independently until 1209, when they submitted to the Mongols under Genghis Khan and, as vassal rulers, existed until 1335. Kara-Khanids, or the Karakhans (Great Khans) Dynasty, was the westernmost of the three Uyghur states. The Karakhans (Karakhanliks) originated from Uyghur tribes settled in the Chu River Valley after 840 and ruled between 940–1212 in Turkistan and Maveraünnehir. They converted to Islam in 934 under the rule of Sultan Satuq Bughra Khan (920–956 AD) and, after taking power over Qarluks in 940, built a federation with Muslim institutions. Together with the Samanids of Samarkand , they considered themselves the defenders of Islam against the Buddhist Uyghur Idiqut. The first capital of the Karahans was established in the city of Balasagun in the Chu River Valley and later was moved to Kashgar . The reign of the Uyghur's Karakhans is especially significant from the point of view of Turkic culture and art history. During this period mosques, schools, bridges, and caravansarais were constructed in the cities. Kashgar, Bukhara and Samarkand became centers of learning. During this period, Turkic literature developed. Among the most important works of the period is Kutadgu Bilig (English: "The Knowledge That Gives Happiness"), written by Yusuf Balasaghuni between the years 1060–1070, and Lughat-at-Turk(The Turkic dictionary) by Mahmud of Kashgar. Both the Idiqut and the Kara-Khanid states eventually submitted to the Kara Khitais. After the rise of the Seljuk Turks in Iran, the Kara-Khanids became nominal vassals of the Seljuks as well. Later they would serve the dual-suzerainty of the Kara-Khitans to the north and the Seljuks to the south. Finally all three states became vassals to Genghis Khan in 1209. Most Uyghur inhabitants of the Besh Balik and Turpan regions did not convert to Islam until the 15th century expansion of the Yarkand Khanate, a Turko-Mongol successor state based in western Tarim. Before converting to Islam, Uyghurs were Tengriist, Manichaeans, Buddhists, or Nestorian Christians. The Chagatai Khanate was a Mongol ruling khanate that initially inherited part of the Mongol Empire that comprised the Uyghur's land controlled by Chagatai Khan (alternative spellings Chagata, Chugta, Chagta, Djagatai, Jagatai), second son of the Mongol emperor Genghis Khan. Chagatai's ulus, or hereditary territory, consisted of the part of the Mongol Empire which extended from the Ili River (today in eastern Kazakhstan ) and Kashgaria (in the western Tarim Basin) to Transoxiana (modern Uzbekistan and Turkmenistan ). After the death of his father, he inherited most of what are now the five Central Asian states and northern Iran , which he ruled until his death in 1242. These lands later came to be known as the Chagatai Khanate, a descendant empire of the Mongol Empire after the latter's split. These territories would later become the Turco-Mongol states. After the death of the Chagatayid ruler Qazan Khan in 1346, the Chagatai Khanate was divided into western (Transoxiana) and eastern (Moghulistan/Uyghuristan) halves, which was later known as "Kashgar and Uyghurstan," according Balkh historian Makhmud ibn Vali (Sea of Mysteries, 1640). Kashgar historian Muhammad Imin Sadr Kashgari recorded the country Uyghurstan in his book Traces of Invasion (Asar al-futuh) in 1780. Power in the western half devolved into the hands of several tribal leaders, most notably the Qara'unas. Khans appointed by the tribal rulers were mere puppets. In the east, Tughlugh Timur (1347–1363), an obscure Chaghataite adventurer, gained ascendancy over the nomadic Mongols, and converted to Islam. In 1360, and again in 1361, he invaded the western half in the hope that he could reunify the khanate. At their greatest extent, the Chaghataite domains extended from the Irtysh River in Siberia down to Ghazni in Afghanistan, and from Transoxiana to the Tarim Basin. Tughlugh Timur was unable to completely subjugate the tribal rulers. After his death in 1363, the Moghuls left Transoxiana, and the Qara'unas' leader Amir Husayn took control of Transoxiana. Tīmur-e Lang (Timur the Lame), or Tamerlane, a Muslim native of Transoxania who claimed descent from Genghis Khan, desired control of the khanate for himself and opposed Amir Husayn. He took Samarkand in 1366, and was recognized as emir in 1370, although he continued to officially act in the name of the Chagatai khans. For over three decades, Timur used the Chagatai lands as the base for extensive conquests, conquering the rulers of Herat in Afghanistan, Shiraz in Persia, Baghdad in Iraq, Delhi in India, and Damascus in Syria. After defeating the Ottoman Turks at Angora, Timur died in 1405 while marching on Ming Dynasty China. The Timurid Dynasty continued under his son, Shah Rukh, who ruled from Herat until his death in 1447. By 1369, the western half (Transoxonia and further west) of the Chagatai Khanate had been conquered by Tamerlane in his attempt to reconstruct the Mongol Empire. The eastern half, mostly under what is now Xinjiang, remained under Chagatai princes that were at times allied or at war with Timurid princes. Until the 17th century, all the remaining Chagatay domains fell under the theocratic regime of Uyghur Apak Khoja and his descendant, the Khojijans, who ruled East Turkestan. Both Transoxonia and the Tarim Basin of East Turkestan became known as Moghulistan or Mughalistan, named after the ruling class of Chagatay and Timurid states which descended from the "Moghol" tribe of Doghlat, but was completely Islamicized and Turkified in language. It was the same Moghol Timurid ruling class that established the Timurid rule on the Indian Subcontinent known as the Mughal Empire. Under the Chagatay Khanate's rule in East Turkestan/Uyghurstan, the culture of the Karakhanids(Uyghurs) became dominant of the largely Muslim state, that the Buddhist populations of the former Karakhoja(Uyghurs) Idikut-ate largely converted into the Muslim faith, and that all Chagatai-speaking Muslims, regardless whether they lived in Turpan or Kashgar, became known by their occupations as Moghols (ruling class), Sarts (merchants and townspeople) and Taranchis (farmers). This triple division of classes among the same Muslim Turkic folk also existed in Transoxonia, regardless whether they were under Timurid or Chagatay, the sense of ethnic kinship between the modern Uyghur and Uzbek peoples remain strong until today. It is widely believed that the modern Uyghur nation acquired its current demographic composition and its current cultural identity during the East Turkestani Chagatay period. The Chagatay period in East Turkestan was marked by instability and internecine warfare kingdoms, with Kashgar, Yarkant and Qomul as major centers. Some Chagatay princes allied with the Timurids and Uzbeks of Transoxonia, and some sought help from the Buddhist Kalmyks. The Chagatay prince Mirza Haidar Kurgan escaped his war-torn homeland Kashgar in the early 16th century to Timurid Tashkent, only to be evicted by the invading Shaybanids. Escaping to the mercy of his Mughal Timurid cousins, which was then rulers of Delhi, India, he gained his final post as governor of Kashmir and wrote the famous Tarikh-i-Rashidi, widely acclaimed as the most comprehensive work on the Uyghur civilization during the East Turkestani Chagatay reign. The Khojijans were originally the Aq Tagh tariqa of the Naqshbandi order, which originated in Timurid Transoxonia. Struggles between two prominent Naqshbandi tariqas the Aq Taghlik and the Kara Taghlik engulfed the entire East Turkestani Chagatay domain in late 17th century, which Apaq Khoja finally triumphant both as a national religious and political leader. The last ruling Chagatay princess married one of the ruling Khojijan princes (descendants of Apaq) and became known as Khanum Pasha. She ruled with brutality after the death of her husband, and singlehandedly slaughtered many of her Khojijan and Chagatayid rivals. She was known to have boiled alive the last Chagatayid princess that could have continued the dynasty. The Khojijan Dynasty fell into chaos despite the brutality of Khanum Pasha. The invading of the Manchu Qing Dynasty over the Jungars brought Manchu military governorship to the Ili Valley north of Tarim basin. Khojijan princes keep putting up struggle against Qing, until Qing was overturned by Chinese. The Manchus, semi-nomads from present-day northeast China, vastly expanded the Qing empire, which they founded in 1644, to include much of Mongolia, East Turkistan, and Tibet. The Manchus invaded Dzungaria in 1759 and dominated it until 1864. The territory was renamed Xinjiang, soon after the Qing invasion of the Dzungars. "Historians estimate that a million people were slaughtered, and the land so devastated that it took a generation for it to recover." During this period, the Uyghurs revolted 42 times against Qing Dynasty rulers. In the revolt of 1864, the Uyghurs were successful in expelling the Qing Dynasty officials from East Turkistan, and founded an independent Kashgaria kingdom, called Yettishar (English: "country of seven cities"). Under the leadership of Yakub Beg, it included Kashgar , Yarkand , Hotan , Aksu , Kucha , Korla and Turpan . The kingdom was recognized by the Ottoman Empire (1873), Tsarist Russia (1872), and Great Britain (1874), which established a mission in the capital, Kashgar. Large Qing (Manchu) Dynasty forces under the General Zuo Zongtang attacked East Turkestan in 1876. Fearing Tsarist expansion into East Turkestan, Great Britain supported the Manchu invasion forces through loans by British banks (mostly through Boston Bank, located in Hong Kong ). After this invasion, East Turkestan was renamed "Xinjiang" or "Sinkiang", which means "New Dominion" or "New Territory", by the Manchu empire on November 18, 1884. Throughout the Qing Dynasty, the sedentary Uyghur inhabitants of the oases around the Tarim speaking Qarluq/Old Uyghur-Chagatay dialects, were largely known as Taranchi, Sart, ruled by their Moghul rulers of Khojijan. Other parts of the Islamic World still knew this area as Moghulistan or as the eastern part of Turkestan. Before being renamed 'Xinjiang' by Qing, this eastern part of Turkestan was more often known as Hui Jiang in Manchu, or "The Islamic territory". The Uyghur identified themselves to each other ­by their oasis, as 'Keriyanese', 'Khotanese', or 'Kashgari'. The Soviets met with the Uyghur in 1921 during a meeting of Turkic leaders in Tashkent. This meeting established the Revolutionary Uyghur Union (Inqilawi Uyghur Itipaqi), a communist nationalist organization that opened underground sections in principal cities of Kashgaria and was active until 1926, when the Soviets recognized the post Qing Sinkiang Government and concluded trade agreements with it. By 1920, Uyghur nationalism had already become a grave challenge to the post Qing warlords controlling Sinkiang. Turpan poet Abdulhaliq, having spent his early years in Semey (Semipalatinsk ) and the Jadid intellectual centres in Uzbekistan, returned to Sinkiang with a penname that he later styled as a surname: Uyghur. He wrote the famous nationalist poem Oyghan, which opened with the line "Ey pekir Uyghur, oyghan!" (Hey poor Uyghur, wake up!). He was later martyred by the Chinese warlord Sheng Shicai in Turpan in March, 1933 for inciting Uyghur nationalist sentiments through his works. Meanwhile, the "Great Game" between Russia and Britain was underway in Central Asia, with former ethnic cultures from Afghanistan through Tajikistan and Uzbekistan to Uyghurstan, being divided. Artificial lines have been drawn between Shiite Persian speakers and Sunni Chagatay Turkic speakers within the same Uzbek cultural sphere and gave rise to the modern Tajik and Uzbek nationalities. Whereas the rather similar Sart-Taranchi populations around Kashgar (Xinjiang) and Andijan (Uzbekistan) divided into the different ethnicities of Uyghur and Uzbeks, Turpan , Qumul , Korla , Kashgar , Yarkant, Yengihissar , Khotan , Gulja through the Tarim Basin and the edges of Sinkiang, were recognized as Uyghur. Uyghur independence activists staged several uprisings against post Qing and Sheng-Kuomintang rule. Twice, in 1933 and 1944, the Uyghurs successfully regained their independence: the East Turkestan Republic, backed by the Soviet Joseph Stalin. In 1949, after the Chinese Nationalists (Kuomingtang) lost the civil war in China, East Turkestan's rulers did not agree to form a confederate relation within Mao's People's Republic of China , however, a plane crash killed most of the East Turkestan Republic's supreme leadership. The crash is sometimes alleged to have been a plot by Mao Zedong, because soon after the crash, General Wang Zhen quickly marched on East Turkistan through the deserts, suppressing anti-invasion uprisings. The remaining East Turkestan Republic leadership that fell under secretary Saipidin Eziz quickly surrendered. Mao turned East Turkistan Republic into the Xinjiang Uyghur Autonomous Region, with the Eastern Turkestan Republicans and remaining Army forced to join the PLA and Saipidin Eziz serving as the region's first CCP governor. Many East Turkestan Republican loyalists, fled into exile in Turkey and Western countries. Yet many other remained and staged anti-CCP ruling activities aimed at regaining their independence. The name Xinjiang is considered offensive by many Uyghur who prefer to use Uyghurstan or Eastern Turkestan (with Turkestan sometimes spelled as Turkistan). There have been many pro-independent events since 1949. The name Uyghurstan or East Turkistan was changed to Xinjiang Uyghur Autonomous Region, where they were the largest ethnic group until the massive recent influx of the ethnic Han people, and the Uyghurs have become a minority in their homeland. The Chinese government has often referred to Uyghur nationalists as "terrorists" and received more global support for it claims to be the Chinese contribution to the "war on terror" since 9/11. Human rights organizations have become concerned that this "war on terror" is being used by the Chinese government as a pretext to repress ethnic Uyghurs. Uyghur exile groups, such as the World Uyghur Congress, also claim that the Chinese government is suppressing Uyghur culture and religion, and responding to demands for independence with human rights violations. "In traditional Uyghur cities like Kashgar , a vibrant bazaar town on the border of Central Asia, the authorities tore down Uyghur stalls across the central square, where Muslim men once gathered for open-air shaves before heading to the central mosque. The local government replaced them with a bland plaza patrolled by Chinese troops. In another unpopular move, Beijing offered financial incentives for ethnic Chinese migrants to come to the province and set up businesses. Now, ethnic Han Chinese dominate nearly all big businesses in the region." Many Uyghurs in the diaspora support Pan-Turkic groups. Several organizations such as the East Turkestan Party provide support for the Turkic Uyghurs. Uyghur political groups have supported peaceful Uyghur nationalism and independence. However, the Chinese Government claims two separatist groups: the East Turkestan Islamic Movement, blamed for 200 attacks between 1990 and 2001, and the recent and still disputed East Turkestan Liberation Organization. In 2009, United States President Barack Obama ordered the release of four Uyghurs from the military detention facility at Guantanamo Bay after 7 years of confinement by the George W. Bush Administration following the attacks on September 11, 2001. Though these individuals were not considered terrorists after US investigation, and were never actually convicted of any crime, the Chinese government insists these men are terrorists and has demanded their extradition to China following their relocation to Palau and Bermuda . In July 2009, a series of violent clashes erupted between Uyghurs, Chinese state police, and Han residents in the city of Ürümqi resulting in at least 197 deaths and scores injured. The relics of the Uyghur culture constitute major collections in the museums of Berlin , London , Paris , Tokyo , St. Petersburg , and New Delhi . During the late 19th and early 20th centuries, scientific and archaeological expeditions to the region of Uyghurstan's Silk Road discovered numerous cave temples, monastery ruins, and wall paintings, as well as valuable miniatures, books, and documents. Explorers from Europe, America, and Japan were amazed by the art treasures found there, and soon their reports caught the attention of an interested public around the world. The manuscripts and documents discovered in Xinjiang (Uyghurstan/Eastern Turkestan) reveal the very high degree of civilization attained by the Uyghurs. This Uyghur power, prestige, and civilization, which dominated Central Asia for over a thousand years, went into a steep decline after the Manchu invasion of their homeland.Throughout the history of Central Asia, they left a lasting imprint on both the culture and tradition of the people of central Asia. Chinese ambassador Wang Yande (939–1006), to the Karakhoja Uyghur Kingdom in 981–984 CE:"I was impressed with the extensive civilization I have found in the Uyghur Kingdom. The beauty of the temples, monasteries, wall paintings, statues, towers, gardens, housings and the palaces built throughout the kingdom cannot be described. The Uyghurs skilfully make things of silver and gold, vases and pitchers. The earliest Uyghur script was derived from Sogdian (and, therefore, ultimately from Aramaic), and was written vertically along a 'spine'. From the 11th century the Uyghurs began using an Arabic-based script similar to that used for Farsi and Urdu and adapted to write Turkic. It was later used to write the very Persianised form of literary Turkic known as Chagatai used in Xinjiang and elsewhere. Then, between the 1930s and 1980s there were four reforms of the Arabic-based script including Cyrillic and Roman- (or, rather, pinyin-)based scripts. In 1984 the Chinese reintroduced a modified Arabic form. Since then efforts have been made at Xinjiang University and among Uyghurs to develop a new romanised orthography more compatible with the use of computers. Additionally, all Uyghur children now must study Chinese in school which, with its immense body of non-alphabetical characters and uninflected tonal system, seems to be particularly difficult for Uyghur students, few of whom learn Chinese well enough to enter university. These rapid changes, imposed by outsiders, have had a very disruptive effect on Uyghur life, culture, and literature. Most of the early Uyghur literary works were translations of Buddhist and Manichean religious texts, but there were also narrative, poetic, and epic works. Some of these have been translated into German, English, Russian, and Turkish. After the general population's conversion to Islam, world-renowned Uyghur scholars emerged and Uyghur literature flourished. Among hundreds of important works surviving from that era are Qutatqu Bilik (Wisdom Of Royal Glory) by Yüsüp Has Hajip (1069–70), Mähmut Qäşqäri's Divan-i Lugat-it Türk- A Dictionary of Turkic Dialects(1072), and Ähmät Yüknäki's Atabetul Hakayik. Perhaps the most famous and well loved pieces of modern Uyghur literature are Abdurehim Otkur's Iz, Oyghanghan Zimin, Zordun Sabir's Anayurt and Ziya Samedi's (former minister of culture in Sinkiang Government in 50's) novels Mayimkhan and Mystery of the years. Some Uyghur books have been translated into various Western languages. Ferdinand de Saussure: "Those who preserved the language and written culture of Central Asia were the Uyghurs." The Uyghurs had an extensive knowledge of medicine and medical practice. Chinese Song Dynasty (906–960) sources indicate that an Uyghur physician named Nanto traveled to China and brought with him many kinds of medicine unknown to the Chinese. There were 103 different herbs used in Uyghur medicine recorded in a medical compendium by Li Shizhen (1518–1593), a Chinese medical authority. Tatar scholar, professor Reşit Rahmeti Arat in Zur Heilkunde der Uighuren (Medical Practices of the Uyghurs) published in 1930 and 1932, in Berlin, discussed Uyghur medicine. Relying on a sketch of a man with an explanation of acupuncture, he and some Western scholars suspect that acupuncture was not a Chinese, but an Uyghur discovery. There are 77 rock-cut caves at the site. Most have rectangular spaces with rounded arch ceilings often divided into four sections, each with a mural of Buddha. The effect is of entire ceiling covers with hundreds of Buddha murals. Some ceilings are painted with a large Buddha surrounded by other figures, including Indians, Persians and Europeans. The quality of the murals vary with some being artistically naive while others are masterpieces of religious art. The cave paintings at Bezeklik and Kizil. Textile design. Muqam is the classical musical style. The 12 Muqams are the national oral epic of the Uyghurs. The muqam system developed among the Uyghur in northwest China and Central Asia over approximately the last 1500 years from the Arabic maqamat modal system that has led to many musical genres among peoples of Eurasia and North Africa. Uyghurs have local muqam systems named after the oasis towns of Xinjiang (Eastern Turkestan), such as Dolan, Ili, Kumul and Turpan . The most fully developed at this point is the Western Tarim region's 12 muqams, which are now a large canon of music and songs recorded from the traditional performers Turdi Akhun and Omar Akhun among others in the 1950s and edited into a more systematic system. Although the folk performers probably improvised their songs as in Turkish taksim performances, the present institutional canon is performed as fixed compositions by ensembles. Each of the 12 muqams (named Rak, Čäbbiyat, Segah, Čahargah, Pänjigah, Özhal, Äjäm, Uššaq, Bayat, Nava, Mušavräk, and Iraq), consists of a main section that begins with a long free rhythm introduction, followed by pieces with characteristic rhythmic patterns that gradually increase in speed. These pieces are arranged in the same sequence in each muqam, although not all muqams have the same pieces. These parts are known as täzä, nuskha, small säliqä, jula, sänäm, large säliqä, päshru, and täkit. Some have an associated instrumental piece known as a märghul ("decoration") following it. Although each named piece has its characteristic rhythmic pattern, the melodies differ, so each piece is generally known by the muqam and the piece: for example, "the Rak nuskha" or "the Segah jula". After the main section, there are two other sections, originally associated with other musical traditions, but included in muqams by performers such as Turdi Akhun and therefore included in the present 12 muqam tradition. The Dastan section includes songs from several of the romantic dastan narratives found widely in Central and South Asia and the Middle East. Each dastan song is followed by an instrumental märghul. The Mäshräp section consists of more lively dance songs that were originally connected with the performances of sama by dervish musicians of Turkistan. Amannisa Khan, sometimes called Amanni Shahan, (1526-1560) is credited with collecting and thereby preserving the Twelve Muqam. Abdulla Abdurehim is a singer who mixes traditional Uyghur music with pop melodies and electronic instruments, and who is probably the most well known musician from this region. He is also known as the "king of Uyghur Pop". His song "Father" is a classical example of this type of music. His music was played during the opening ceremonies of the Beijing 2008 Olympic Games. Russian scholar Pantusov writes that the Uyghurs manufactured their own musical instruments; they had 62 different kinds of musical instruments and in every Uyghur home there used to be an instrument called a "dutar". Ethnic Uygurs in Hunan Live in Harmony with Han Chinese. Chinese Cultural Studies: Ethnography of China: Brief Guide. The term "Turk" was a generic label used by members of many ethnic groups in Soviet Central Asia. Often the deciding factor for classifying individuals belonging to Turkic nationalities in the Soviet censuses was less what the people called themselves by nationality than what language they claimed as their native tongue. Thus, people who called themselves "Turk" but spoke Uzbek were classified in Soviet censuses as Uzbek by nationality. See Brian D. Silver, "“The Ethnic and Language Dimensions in Russian and Soviet Censuses,” in Ralph S. Clem, Ed., Research Guide to the Russian and Soviet Censuses (Ithaca: Cornell Univ. Press, 1986): 70-97. M. Zakiev, 2003, Origin of Türks and Tatars, pp. 54, 58, ISBN 5-85840-317-4, in English. Duan, "Dingling, Gaoju and Tiele", p. 325-326. Suribadalaha, "New Studies of the Origins of the Mongols", p. 46-47. PHI Persian Literature in Translation. Tyler, Christian. (2003). Wild West China: The Untold Story of a Frontier Land, p. 55. John Murray, London. ISBN 0-7195-6341 0. China 'crushing Muslim Uighurs' BBC News Online, 2007-04-21. Retrieved 2007-04-21. The Plight of the Uyghur People. The New Republic, " Home Court Advantage", by Joshua Kurlantzick, Post Date, March 25, 2008. After 7 years in Guantanamo, resettled Uyghurs grateful for freedom CNN, 2009-06-12. Retrieved 2009-06-13. Professor Reşit Rahmeti Arat, Zur Heilkunde der Uighuren (Medical Practices of the Uyghurs), Berlin (1930 and 1932). Millward, James A. and Nabijan Tursun, (2004) "Political History and Strategies of Control, 1884–1978" in Xinjiang: China's Muslim Borderland, ed. S. Frederick Starr. Published by M. E. Sharpe. ISBN 978-0765613189. Tyler, Christian. (2003). Wild West China: The Untold Story of a Frontier Land. John Murray, London. ISBN 0-7195-6341 0. Devastating Blows: Religious Repression of Uighurs in Xinjiang Human Rights Watch Report. Apr. 2005. Xinjiang, China's Restive Northwest Human Rights Watch Backgrounder. Nov. 2000.